White Cauliflower: Like broccoli, cauliflower is a member of the cruciferous family. It has wonderful phytochemicals which fight off diseases. Remove the jacket leaves, core out the stem, and cut into florets, much like broccoli. 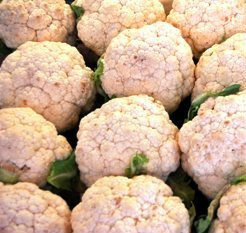 If boiling cauliflower, add a teaspoon of fresh lemon juice to the water to maintain white color. 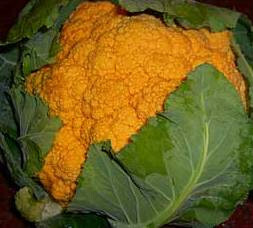 Orange Cauliflower: It is also known as “Cheddar Cauliflower”. 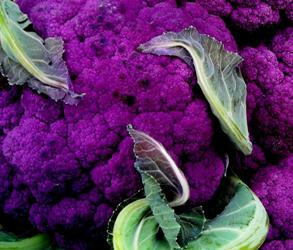 The flavor is like white cauliflower, however, the beta-carotene which gives it the orange pigment, is actually higher in vitamins A and C.
Purple Cauliflower: The purple color is caused by the presence of the antioxidant group anthocyanin, which can also be found in red cabbage and red wine. Broccoflower: Pronounced “brahk-uh-flow-er,” this round vegetable looks like a cross between broccoli and cauliflower, but is actually more cauliflower than broccoli. 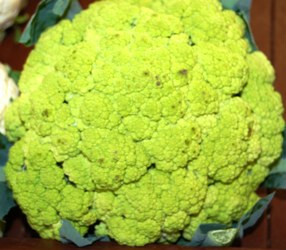 Green cauliflower is a genetic cross that combines the physical features of cauliflower with the chlorophyll of broccoli. It has a lime-green head and a sweeter taste than conventional cauliflower. Use for cooking and in soups, dips and salads just as you would regular cauliflower.